FOUR LEGGED FRIENDSHIPS HAVE A PLACE TO FLOURISH…AND FROLIC. Dogs have a funny way of finding the people who need them, filling a space in their hearts that they didn’t even know they had. As quoted by Josh Billings, “they are simply the only thing on earth that will truly love you more than they love themselves”. At Oldfield, we understand the importance of man’s best friend and have created a safe haven for your dog to burn off some energy and socialize with its 4-legged friends. 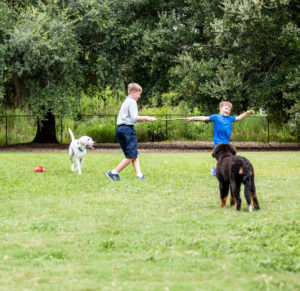 Our large fenced in play area includes a secure transition zone to unleash before entering, large signature Oldfield Live oak trees to provide shade, plenty of room to run and a doggie pool to take a cool dip after a long day of play. Open sunrise to sunset, dogs and their owners are sure to enjoy their time spent at the Oldfield Dog Park.